When it comes to selling your old phone or tablet, you have a few options. However, when it comes time to get rid of your old television, headphones or gaming system your choices are a bit more limited. Those types of sales often happen on sites like eBay and Craiglist. While sometimes effective, the procedure can involve long wait times to sell your stuff, dealing with flaky buyers and trying to figure out exactly how to ship your 3-year-old 40-inch plasma screen TV safely without the original box. FOBO, a startup that recently launched in San Francisco, is hoping to simplify the art of selling your old electronics using the one you carry with you most often: your smartphone. The app holds 97-minute auctions for your stuff that are restricted to just people who live in your geographic area. If you’re in the market for something in particular, you can sign up to receive a push notification when what you’re looking for goes on sale. In order to bid on an item you’re required to have a credit card on file with the service, and if you win an auction your card is instantly authorized for the purchase. When you do buy, you’re required to pick up your item within 48 hours. Miss the window, and you’re charged a $10 flaker fee. The best part about the service? Your electronics are guaranteed to sell. For each item, FOBO sets a starting price based on its own research on the item and what it might potentially sell for. If no one bids on your gadget, FOBO agrees to pay that starting price, and buys the item from you. Just like other auction sites, FOBO takes a cut of your final sale price: 15 percent. You can also leave feedback for both buyers and sellers, so you know who you’re going into business with. A comment stream on each item allows you to connect with potential buyers and answer questions while an auction is in progress. 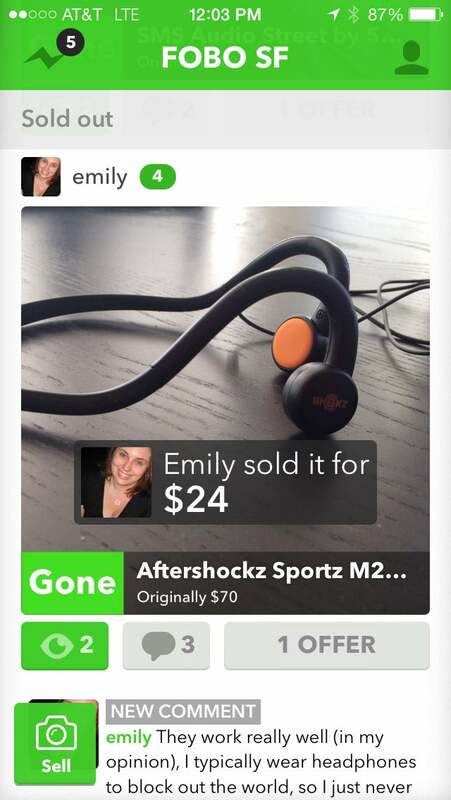 When you do sell an item, money is virtually exchanged between you and the buyer through the app when you meet up. Funds are then transferred to the seller's bank account, a process that takes around two days to finalize. FOBO is the brainchild of the team behind Yardsale, a similar app that allows you to buy and sell everything from your old bike to your old winter coat. The app is currently live in San Francisco only, with plans to expand to other areas soon.